• Antitheft System – Guard against phone loss or theft with multiple layers of security that allow you to maintain control remotely over phone-stored data with simple to use text commands. 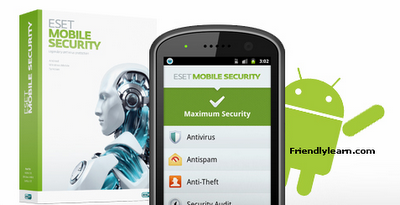 • Advanced On-Access Scanning – Protect your smartphone with ESET's heuristics detection that alerts you to any suspicious activity on your phone. All applications, files, folders and SD memory cards are continually scanned for trojans, viruses, worms, spyware, spam, and other attacks. • SIM Matching – Create a list of trusted SIM cards for your phone. In case of an unauthorized SIM card insertion, you are automatically notified by a text message sent to an alternate phone number. • Security Audit with built-in Task Manager - Monitor all vital phone functions, including battery life, free disk space, running processes, Bluetooth, and device visibility. Take action on the spot, including terminating any processes that increase your security risk. • Settings and Uninstall Protection – Password-protect your settings from being modified and unauthorized uninstallation of ESET Mobile Security for Android (available for Android version 2.2 or higher).